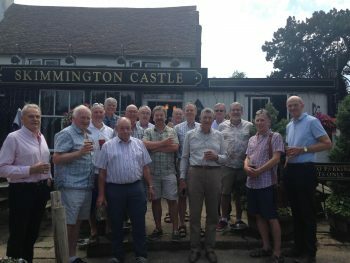 A very warm Tuesday 3rd July saw the latest of the Class of 1970 reunions at the Skimmington Castle in Reigate. Our contact list is now over 30 strong and 16 of us gathered for another bout of banter and reminiscing, making it the largest gathering to date. In the picture from left to right are Keith Towers, Ed Andrews, Peter Chesterton, Dale Mockford, Chris Whitfield, Nick Chatham, Jim Mon, Mike Livesey, Tony Legat, Brian Lovering, Ali Randall, Travis McCall, Martin Stanton, Adrian Figgess and Peter Gale. Sadly, Dave “Mad Dog” Mason missed the photo-op but was there for the meal! If you would like to be included on our email list, Whatsapp or Facebook group, please contact Dale on 07718904223. He would love to hear from you.